Ideal Diamonds: Math or Myth? Ask yourself this one simple question: What is an ideal diamond? Most industry professionals will say that an ideal diamond is one that closely matches the model created by Marcel Tolkowsky. 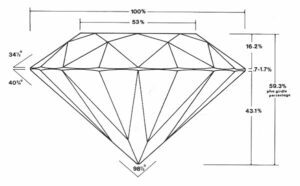 GIA breaks diamond cut grades down to several categories and even the top category contains a range of measurements that may differ from the Tolkowsky model. It is all based on physics and math and while math is always correct, is it always right? Is there really a difference between an ideal cut and a poor cut? Yes, of course there is. Well-cut diamonds are essentially optical devices designed to gather light and reflect most of it back through the table and crown. An ideal cut will be very bright, while very poor cuts will lack strong brilliance. The difference is obvious to the trained eye and occasionally apparent to the consumer’s eye. Yes and No! It matters mostly to the wallet. Ideal cuts demand a much higher price. The price slides down as the cut drifts away from the mathematical ideal. Most consumers cannot tell the difference in the stones just by looking at them. But they do see the difference when they hear the price. A salesman has to work hard to convince a customer that an ideal stone is worth the extra money, since most can’t really see the difference with their own eyes. Some customers want mathematical precision and will pay for it, but most people buy diamonds for emotional reasons and an ideal cut diamond is often not their first choice. Math is useless to them and can actually get in the way of a sale, especially if it tells them that their emotional response is incorrect or flawed. I was very surprised that not a single person chose the ideal cut. Even more surprising, 60% of them chose one of the worst cuts, a very spready stone! The goal of a diamond salesman should not be to convince a customer that one diamond is better than another. It should be to see which stone lights up her eyes and gives her an emotional reaction. They will either love a diamond or not. Our opinion or that of a lab or mathematical formula doesn’t matter. An ideal diamond is one that goes home with a happy customer. It’s that simple.